The upside down jellyfish is so called because it tends to stay upside down on the bottom and is commonly found in shallow mangrove swamps, mudflats, and turtle grass flats in Florida and various other similar environments around the world, where it lives usually upside-down on the bottom. Where found, there may be numerous individuals with varying shades of white, blue, green and brown. They have a mild sting since they are primarily photosynthetic, but sensitive individuals may have a stronger reaction. 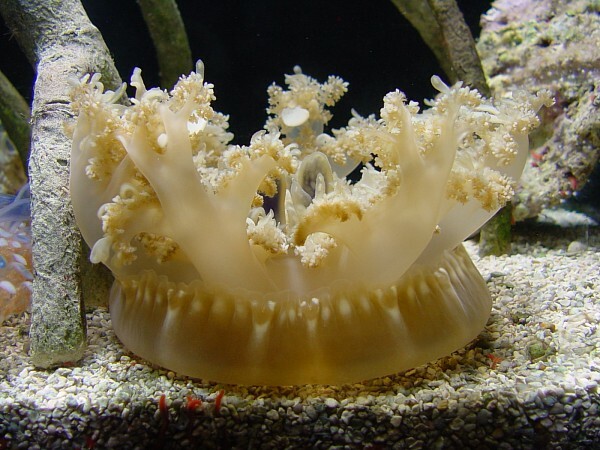 The stinging cells are excreted in a mucus; swimming over these jellies (especially using swim fins) may cause transparent, essentially invisible, sheets of this mucus to be lifted up into the water column, where they are then encountered by unsuspecting swimmers. The stings, appearing in the form of a red rash-like skin irritation, are notorious for being extraordinarily itchy.